The conventional treatment for Sleep apnea is Positive Air Pressure (PAP) therapy. There are three types of devices that may be used, Continuous Positive Air pressure (C-PAP), Bi-level Positive Air Pressure (Bi-PAP), and a recently available device that will automatically adjust to the pressure necessary to keep your airway open A-PAP. The C-PAP is a compact device that gently blows air at a constant pressure thru a tube and mask. This constant air pressure acts as a splint to keep the airway open. 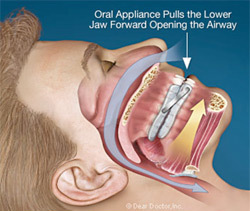 The upper airway remains open and your breathing remains uninterrupted while you are sleeping. C-PAP equipment should be used nightly to obtain the optimal benefit. It is imperative that you are properly fitted for a nasal or full face, nasal pillows or other accessory to improve comfort and compliance. Bi-PAP therapy uses a similar device and interface as CPAP. The primary difference is the ability to decrease the pressure upon exhalation, making it easier to exhale. Bi-Pap is used as an alternative for patients that require higher pressures or have weakness of the muscles needed to breathe. Modern Bi-Pap machines have features that detect when the person is inhaling or exhaling and react accordingly making it more comfortable. A-PAP therapy can automatically adjust to the pressure necessary to keep the airway open. The pressure that is needed to eliminate obstructive sleep apnea is variable during the night. You may need a higher pressure in REM, dream sleep, or while sleeping on your back. The ability to deliver the ideal air pressure at just the right time allows you to sleep in whatever position is most comfortable for you. Our recommendation will always be to follow up your home sleep study with your referring physician or a sleep specialist. Prescriptions for treatment with PAP therapy can be made based on the results of a Home Sleep Study. An additional benefit to using the A-PAP is that the device will adjust to the individual’s life style changes. Weight loss or gain, consuming alcoholic beverages or changes in medication can all be automatically be accounted for. 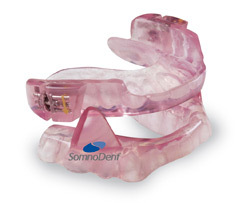 Oral Appliances are an effective treatment for snoring and mild to moderate obstructive sleep apnea. The devices fall into two broad groups, the first is the tongue advancing which can be fitted by the patients and the second being a tongue retaining devise that is custom made for the patient by a dentist. The advancement of the lower jaw promotes a less obstructed airway and may provide adequate airflow, decreasing SDB. Oral appliances have been considered a secondary treatment for SDB when the patient is unable to comply with CPAP therapy. While recommended for snoring or mild to moderate sleep apnea the devices have better compliance than CPAP therapy. The individual’s facial structure should also be a consideration when contemplating this alternative. Positional Consideration during sleep may be used as a treatment. The patient may have an increase in snoring or obstructive apneas while lying on their back. By simply sleeping on their sides they are able to decrease the severity of their SDB. People frequently change positions while sleeping. This can be overcome by making it uncomfortable to lie on your back. A long pillow may be a start but often will shift. Surgery is typically the last option for the treatment of SDB in adults. It is often considered when the patient is unable to comply with alternative treatments or when anatomical abnormalities exist. Children with loud snoring or witnessed pauses in breathing often undergo a tonsillectomy and adenoidectomy. This is a more common and extremely effective treatment for pediatric SDB. Prior to arriving at these alternatives a team of experts should be consulted to decide if this is the best option for you. In that team you should include your Primary Care, your Ear Nose and Throat and an experienced surgeon.